Drawing over the Colour Line is a new project which started in January 2012 and is run by The Equiano Centre in UCL’s Department of Geography. We have been funded by the Arts and Humanities Research Council (AHRC) to carry out a project over the next two years looking at the experiences and identities of Black people in London during the inter-war period by exploring their relationship with the art world. 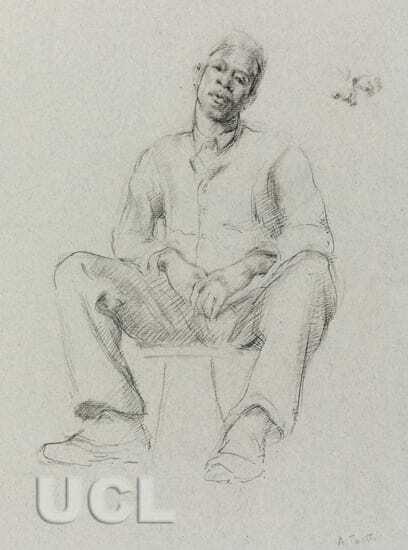 We are specifically focusing on the histories of people of African and Asian heritage who worked as artists and as artists’ models, and contextualising these histories within an examination of interwar political and social movements including pan-Africanism and anti-colonial activism and also histories of empire, migration, and diaspora. The end result of the project will be a public database documenting artworks in various locations, including public and private collections, which relate to Black artists and artists’ models. We are working with UCL Art Museum throughout the project, researching the collections and carrying out various or co-hosting public events. The project explores some of the artwork created by students based at the Slade School of Fine Art during the 1920s and 1930s, many of which are now located at UCL Art Museum. For example, we are researching the drawings of models of African heritage which won Slade student prizes. Additionally, we will be working with the museum to explore these collections in greater depth by running a summer school for young people, a pop-up exhibition and contributing towards a research guide on Black history and the collections of UCL Art Museum. Visit our blog and twitter for more details: http://drawingoverthecolourline.wordpress.com/ and http://twitter.com/DColourLine .